The second Thursday Night Smackdown of 2016 presented us with Intercontinental Champion Dean Ambrose, Neville, Kevin Owens and Sheamus opening the show, Kalisto defending his newly won United States Championship in a rematch with Alberto Del Rio and Neville teaming with Dean Ambrose to clash with Kevin Owens & Sheamus in the main event...but was it any good? The opening segment was a waste of television time, with the bout it created already being advertised for the show on Monday Night RAW three days previous. The only real bit of storyline advancement can in the first minute or so when Dean Ambrose challenged Kevin Owens to a Last Man Standing match at the Royal Rumble with the Intercontinental title on the line. Whilst that was a mouth-watering prospect that could very well steal the show, the rest of the segment was paint by number, with Sheamus heading out to the arena, before being joined by Kevin Owens, before Neville came out to even the score. Sheamus struggled with his promo, stumbling over his words to point where I'm surprised that WWE didn't re-film it. If there had been no previous storyline between the four guys before this episode, then this segment would have been so bad, but seeing as Neville, Ambrose, Owens and Sheamus have criss-crossed rivalries for a few weeks now, this was a pretty pointless exercise. The time could easily have been given to other bouts to add more depth to other feuds. The United States Championship match between champion Kalisto and challenger Alberto Del Rio took a while to get going for me, but once Del Rio had hit an armbreaker off the middle ropes and King Barrett had arrived at ringside we got a much more meaty contest. Kalisto excelled in the underdog role, selling his arm well and his move-set allows for some exciting hope spots, the most impressive being escaping Del Rio's Tree of Woe double stomp and reversing into a head scissors that sent the former World Heavyweight Champion crashing off the top, whilst a hurricanrana driver got a big reaction after a well-worked false finish. Barrett gave the match a different dimension, allowing Del Rio to stay in control for some time towards the end of the contest, whilst also stopping Kalisto from looking weak, with the Preston-native's most memorable involvement being when he moved Del Rio out of the line of fire when the King of Flight attempted a suicide dive variation. With the commentary team doing a solid job putting over both men, Kalisto had two lengthy spells in the Cross Armbreaker before eventually submitting, handing the United States Championship to Del Rio after less than four days of winning it (in TV land anyway, in reality it was less than 24 hours with the belt). I'd have like to have seen their two title matches happen on Smackdown with this bout happening next week, to give Kalisto a bit more time with the belt, and push the B show just that little bit more. It's frustrating to see the title switched so quickly, but Kalisto has been elevated hugely over the last two weeks or so and he's still got a rematch for the title, so overall I think the 29 year old has benefited from this programme, so far. Time will tell if it pays off for him in the long run. Intercontinental Champion Dean Ambrose & Neville battled Kevin Owens and Sheamus in a decent main event, that was let down by an unnecessary DQ finish. Neville worked well as the Geordie in peril, putting on a believable fight against the larger, Sheamus and Owens. In particular, The Man That Gravity Forgot and The Prize Fighter put on some quality action, weaving in some nice narrative around Neville attempting to hit a German Suplex, with the Breakout Star slammy winner managing to get the hot tag to Ambrose after finally hitting the move. 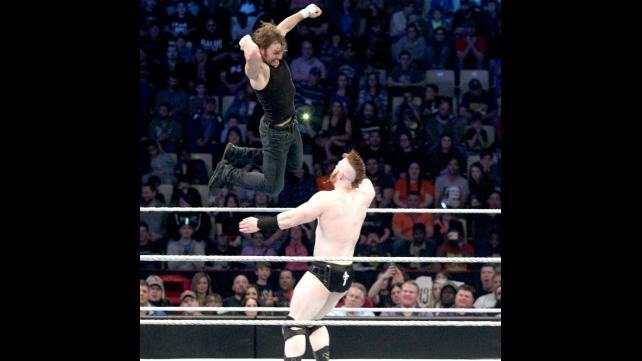 The highlight of the contest came during Ambrose's flurry of action on Sheamus, when Owens interjecting himself to deliver a kick to the Lunatic Fringes' head as the IC Champ went for his signature Rebound Lariat. It was a shame then that when the bout was really looking to heat up with some brawling on the outside, we saw Owens cause the DQ by dropping the top of the announce table on Ambrose. The third non-finish in a row for Ambrose bouts on TV and this was the lamest of the bunch. I understand the need to keep both Owens and Ambrose looking good heading into the Last Man Standing bout, so why not really go for it and have Owens try to do some real harm to the Champion to give himself the advantage, not drop a flimsy announce table lid on him. A little bit more creativity would have gone a long way here. This promising episode of Smackdown was let down by two things, a lack of creativity and a lack of time afforded certain storylines and matches. Alberto Del Rio winning back the United States Championship from Kalisto was the highlight of the show, with the duo putting on an enjoyable encounter. The top and tail stuff with Dean Ambrose, Neville, Kevin Owens and Sheamus had some interesting elements, but ultimately was a bit of a let down in it's execution, with the opening segment being surplus to requirements. Outside of the open, hour topper and main event, nothing was given enough time to really have much of an effect, with the supposed "main event" Tables match running way to short. A bit of extra attention for this would've afforded this show the depth that it needed to get a higher rating.